Veteran actor Yemi Adeyemi, who is popularly called Suara, a name that stuck since his role in Super Story series, Oh Father! Oh Daughter! where he is a polygamist married to Buky Wright, and Sola Shobowale as his second wife, said his marriage was once on the brink of collapse on account of his intimate relationship with the latter. Suara disclosed this to New Telegraph saying his wife in real life, who he lives with in Ibadan at a time believed he was having seedy underground dealings with the actress and was filled with indignation. He said his spouse held on to the impression until the day the Ondo-born actress who acted Toyin Tomato, his wife in Oh Father! Oh Daughter! visited him at home. Suara told the paper, “My wife was very angry with me. 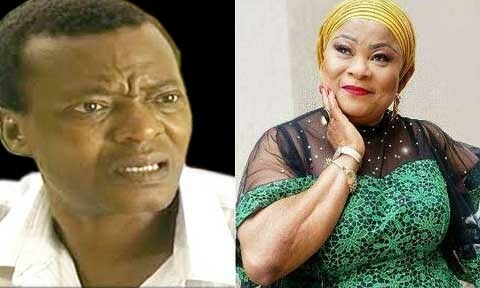 She thought I actually had an affair with Sola Sobowale (Toyin Tomato). It was not until they got to know each that she was convinced that I was not going out with her. When Sola came, she was calling me ‘Brother mi’, which is what she used to call me. “Actually, I came to Lagos through her advice. I did not even know that we were going to act together in Super Story. My wife was so eager to meet her. “So when Sola came to my house they met. Annoyingly, my wife was sitting watching what was going to happen that day.